The Gloria produces 44,000 btu. and will heat an area of up to 1,800 square feet with 85% overall efficiency. Remote control, GPRS text message control and a wall thermostat are available as options. Burn time Up to 32 hrs. on low heat setting. Window Size 12 in. by 11 in. Rear Vent Height 15.8 in. 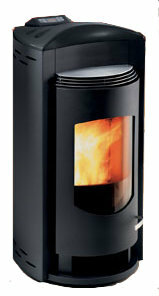 If you would like to leave a review of the Ecoteck Gloria pellet stove, please use the form on the contact page.